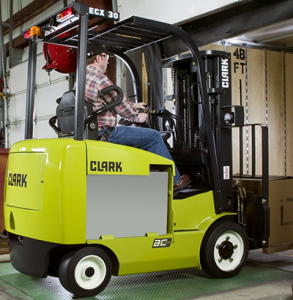 This 4-wheel lift truck series offers maneuverability, safety and dependability with its cushion tires and capable lifting capacity. This forklift is optimal for indoor manufacturing, warehousing, beverage, bottling and shipping and receiving applications. Each lift truck comes with programmable safety and performance features to fit your exact needs. Similar to other series of electric trucks, the system is efficient, protected from outside contaminants and its easily accessible for service. The 3 forms of regenerative braking extend battery life by transferring the energy back into the battery from the braking system. This powerful lift truck produces twice the draw bar pull, making it competitive with IC trucks. This system provides 20 performance settings that can be attuned to fit your requirements. For safety, forward and reverse speed presets can be set separately. Controlled Descent senses when the truck is going down an incline so it can ignite counter torque to assist in the process. Ramp Start makes sure the truck doesn’t roll back when going up a hill by adding more torque. Nested I-Channels keep cylinders, hoses and chains that provides the best visibility while the hydraulic cushioning valve keeps shock and vibration down. The 6 rollers disperse the load evenly. CLARK’s ED30 one-piece housing reduces the possibility of leaks, and it’s helical gears produces a smooth and quiet operation. The steer axle is secured, but it’s also easily accessible to fix mechanisms. An alarm sounds if the operator doesn’t set the parking brake. The back-lit LCD display turns on automatically with the key switch and provides excellent visibility in direct sunlight. This truck can also be ordered as a turret truck ideal for working both sides of an aisle or for carrying wide loads. See the turret truck page for more details. These forklifts are available for sale or lease. Contact a Forklifts of Toledo Sales Representative for pricing and additional information.